A rare nautical triangulation chart of the California coast from Pt. 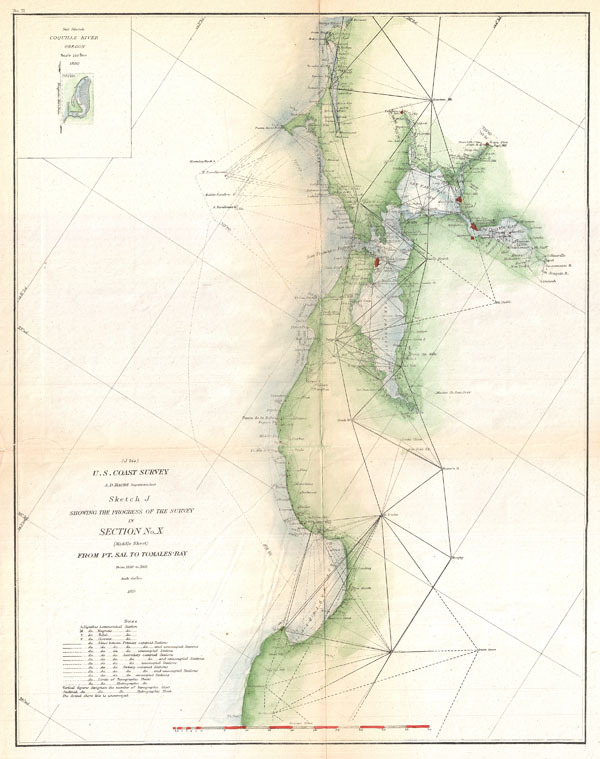 Sal to Tomales Bay, including the San Francisco Bay area, by the U. S. Coast Survey, 1865. Depicts the much of the shoreline of southern California with numerous notations regarding the various ports and sailing references. Produced in 1865 under the Supervision of A. D. Bache, the most dynamic and influential leaders of the U. S. Coast Survey. Dated. Report of the Superintendant of the United States Coast Survey, Washington, (1865 edition). Very good condition. Minor toning along original fold lines. Minor closed and repaired tear from left margin, near title area.